This project had two halves: to provide interpretation of, and access to, the Carnach woodland through booklets, information panels and a waymarked trail; and to create an interpretation of an Iron Age roundhouse on the edge of the hazel woods. Applecross Hazel Woods is an Area of Semi-Ancient Woodland. The Atlantic hazel woods and the abundance of lichen make for breathtaking sight. However the area was not easily accessible and very little was understood about the history or this natural landscape. Through the Woodland, Grassland and Wildlife programme, a management plan was produced in order to ensure that the woodland flourished, and a small section was fenced and coppiced in order to monitor growth of wildlife and the trees themselves. This project involved making the area accessible by marking a trail through the woodland, one that would help people to appreciate the history of that landscape. This trail links up with the larger Archaeological Trail. A Carnach Woodland leaflet was produced, detailing all of the flora and fauna that can be found. An Archaeology Walks booklet was also produced, which includes Carnach Woodland. 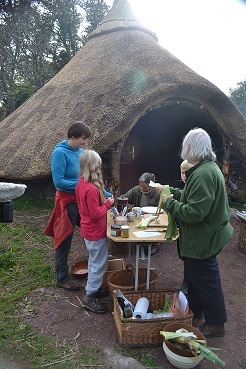 The interpretation of an Iron Age roundhouse was created over the course of three years by volunteers working with the Applecross Archaeology Society and the Applecross Walks and Traditional Crafts Group. It really became a project that the local community could be proud of, and many hours of hard work were dedicated to making the building something that everyone could enjoy. From the first stone laid for the foundations, to the months of building the roof frame in preparation for Brian Wilson (master thatcher) to undertake the final thatch, the roundhouse attracted children, working parents, retired craftspeople and everyone in between. The result is a magnificent structure that has been used extensively for workshops, story telling, Iron Age cooking and even the odd party. The structure is managed by the Applecross Walks and Traditional Crafts Group. This content comes from a hidden element on this page. If you try to open a new Colorbox while it is already open, it will update itself with the new content.